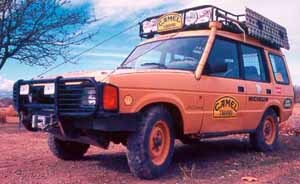 The Land Rover Discovery Camel Trophy Vehicle (The golden years). It is my goal to preserve this information, so what better place to put it, than here. Some 4×4’s live a long life at a sedate pace. Others do their livin’ at a frantic pace and that’s where pedigree counts. This 1993 Land Rover Discovery definitely fits into the latter category. It spent the majority of its life in competition and in places that would make most of us go pale in fear. Its survival is only a step short of a miracle. Some of you might need a reminder on what the Camel Trophy was all about. Imagine taking a small fleet of identical, basically stock, expedition-prepped vehicles to areas of the world where “road” is a loosely defined term. A course is plotted across 1,000-2000 miles of the most desolate and hospitable terrain and unreasonable daily mileage goals are demanded. The roof rack carries four expedition cases, a second spare tire, an exhaust jack, sand tracks, axe, shovel, pick and tow ropes. Inside, the vehicle carried 12 gallons of water, 12 gallons of fuel, two food cases, a tool case, a tow bar and four more expedition cases. A conservative estimate is that this rig weighed a good 8,000 pounds loaded, sometimes more. The Land Rover Tdi engine is noted worldwide for durability, economy and a lot of torque. Even with 195 lbs-ft of torque on tap at 1800 rpms, it struggled to haul the bulk of the loaded Discovery over hostile terrain. Empty, it’s pretty sprightly and offers around 30 mpg.All were powered by a four-cylinder diesel engine whose only mod was a snorkel. The vehicles were prepped with mostly off-the-shelf Land Rover parts, consisting mainly of heavy-duty springs, HD four-pinion axles with open differentials and a few other HD goodies that varied according to model. Special equipment included a full internal roll cage, roof racks, front brush guard, engine and fuel tank skidplates, winch mounts for the Superwinch Ox or Warn winches, front and rear towing points, two fire extinguishers, eight auxiliary driving lights, Terra-Trip navigation computers (later GPS units were also incorporated) and Michelin XCL mud tires. ENGINE Inter-cooled, turbocharged direct-injection diesel engine with four cylinders in-line. coil springs with additional helper springs. Mechanically the Mongolia ‘97 Defenders are more or less identical to their predecessors, but cosmetically they were a new departure. The event itself had turned into more of a lifestyle event and the vehicle evolved to reflect this. The drivetrain is similar to the Kalimantan ‘96 Defenders which feature a rear anti roll bar and modified rear tank guard, which for Camel Trophy is 10mm thick, as opposed to the Safety Devices standard of 8mm. They appear to be fitted with the later 24 spline 2 pinion final drive in the front axle with the heavier duty 24 spline half shafts. (Earlier vehicles had 4 pinion final drives.) 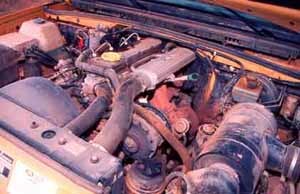 Unlike the Mongolia Discoveries, the Defender engine is not fitted with EGR. The vehicle is also fitted with a NAS spec. digital odometer with a magnetic pick up on the gearbox where the speedo cable would normally be present. The fuel gauge and temp gauge are similarly NAS spec. 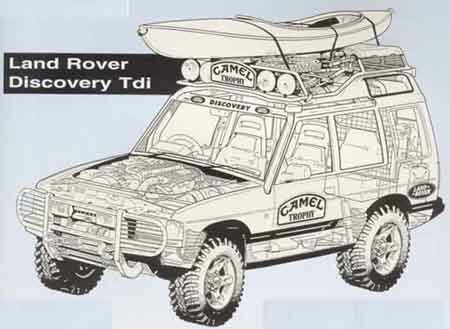 The reason for this is that until 1997 Camel vehicles were fitted with a Terra trip unit, whereas the Mongolia vehicles were fitted with a Pacer Unit which was specially made for Camel Trophy ‘97. This unit is connected to the digital speedometer and does not require a separate pick up. Outwardly the vehicles appeared very different being fitted with deep dish (XS) alloy wheels and B F Goodrich 235/85 R 16 Mud Terrain tyres. 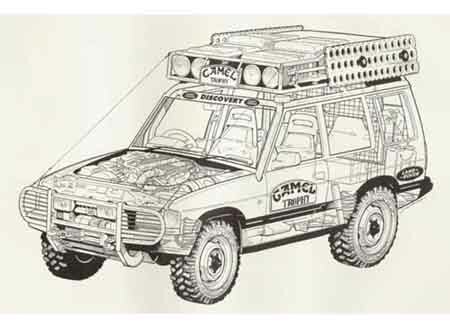 The vehicles were equipped with the proven Superwinch Husky unit and other normal Camel Trophy extras. Sponsorship decals were much more prevalent being positioned just about everywhere and a green and white mountain range stripe stretched along the bottom of the doors and wings with the Mongolia ‘97 script superimposed. Although the “One Life, Live It” slogan had been adopted for the event, this was not to appear on the vehicles until the Tierra del Fuego event the following year. Sponsorship decals were positioned as follows. Shell sticker at front of front wing side panel, Lee Cougan sticker over the top of the front wheel arch, and Perception Kayak sticker above Tdi sticker. The front door featured a slightly smaller sized Camel Trophy logo in Green, but positioned slightly higher up the door. No convoy number was present on the doors. The rear side door featured a small Singapore Airlines sticker on the flat panel under the window, and the rear quarter panel featured a Sony Betacam sticker half way along on the curved section. Landrover Ovals were placed at the bottom of the panel, and the Camel Adventure Wear decals were placed on the front sliding windows. Large Mongolian wavy flags were positioned on the rear sliding windows overlapping with the bodywork. Following the event the majority of vehicles were used for the Tierra del Fuego international selection trials in Sweden , whilst others were used for the Tierra del Fuego pre-scout. A number of changes were made to the vehicles, which were to affect their appearance greatly. The alloy wheels were removed and replaced with 6.5L x 16 Heavy Duty steel rims fitted with 7.50 R 16 Michelin XZL tyres. This was as a direct result of a very considerable number of failures of the alloy wheels on the event. Following a change in sponsorship the Husky winches were replaced with the Warn 8274-50, which had previously been used on all the 1980’s events. For selection trials the vehicles had the original decals removed and new ones applied reflecting the change in sponsorship, although the positioning is subtly different from that seen on the ‘98 event. New positions are as follows: Front wing plain with exception of Warn W on top front of side panel. Camel Adventure Wear stickers on rear sliding window, and a Shell logo fitted adjacent to the fuel filler. On the flat area above the curve of the quarter panel were fitted three decals. To the rear was fitted a Lee Cougan sticker, A Sony sticker was fitted in the centre, and towards the front a Scott sticker, but without the USA suffix. It is in this condition that the majority of the vehicles were discharged from Camel service. Interestingly, although the Mongolia mountain freeze was removed from the bottom of the doors, the Mongolia Convoy plate remained on the bonnet. This is more amazing since generic metal CT 98 plates were made. A number of the vehicles remained in Camel service, and some were used as support vehicles on the ‘98 event too. Retirement was not gentle and easy for them: The majority being used at Eastnor Castle for events such as Global Challenge. Following the ‘98 pre-scout one of the vehicles was sprayed silver along with some other trial liveries on a Freelander and Disco, although this vehicle was subsequently resprayed Sandglow. 1997 was to be the last year with full heavy duty spec Defenders. The subsequent Tierra del Fuego event Defenders were far more standard with standard suspension and wheels. The ‘98 vehicles were also produced in greater numbers since each team had a 110 support vehicle. All Mongolian spec Defenders have a Pxxx KAC registration and had the colour listed on the V5 as brown, for reasons that aren’t entirely clear.